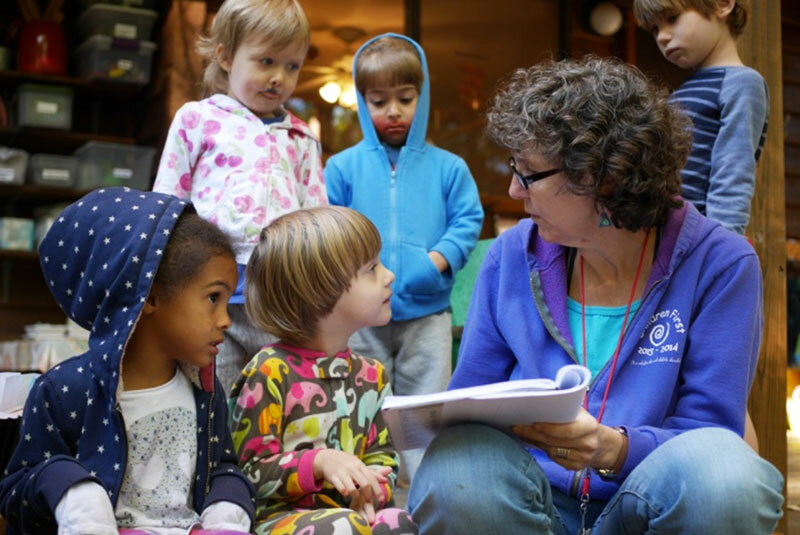 “Developmentally appropriate” is another way of saying that we design our environment, our routines, our activities and our interactions to reflect best current knowledge about how young children learn and about what living conditions allow them to thrive. Primarily, our understanding of child development drives our commitment to providing children with long blocks of uninterrupted time for play and with continuous access to the outdoors. Children First serves 12 children in one mixed age group. Children Firsters range in age from older two-year-olds to five-year-olds. Research and our own experiences have persuaded us that mixed-age grouping offers compelling benefits. Part of this benefit comes from time; where most programs move children from group to group every year, Children Firsters are here for two and sometimes three years. 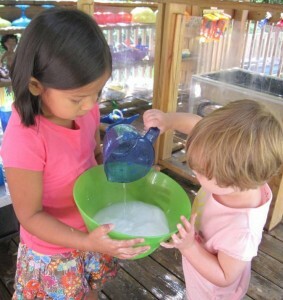 Friendships deepen into a relaxed and productive intimacy when children are together with their teachers and peers long enough to build a shared history of connection and experience. As each new school year begins, older children carry and model the culture and practices they already know so well, which increases the ease with which new children adjust to school. 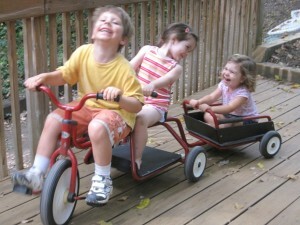 Also, mixed-age grouping creates a powerful context that complements children’s experience in their own family -children who are the oldest at home usually have the experience of being younger at school for at least a year; children who are younger at home eventually get to be the oldest here; and “only” children learn about being with both older and younger companions. “Child-centered” means that we design activities and adjust routines in response to the particular strengths, challenges and passions of individual children. For instance, one fall we had two children with an intense (and contagious!) interest in trains, so we worked with them to develop a month-long project about trains, culminating in a ride to Raleigh on Amtrak. Another year, our older boys’ consuming curiosity about fire led to a research project and a visit from our local fire inspector. In a year when our older girls shared a passion for making music, we made time for a weekly sing-a-long with families, and tried some new song-writing activities. 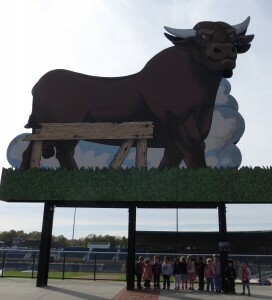 More recently, one boy’s fascination with the Durham Bull took us to the nearby ballpark for some close-up study of the icon we were seeing in so many buildings, drawings and pretending games. “Family-centered” means that families and teachers work together to set goals and to plan for each child. At Children First, families have a genuine say in the daily experiences of their child at school. For instance, a father’s concern about his child’s preoccupation with monsters, dinosaurs, and other scary creatures might spur a series of activities at school to help children express their fears and practice ways of coping with worries. Or a grandparent who notices her granddaughter’s sudden interest in numbers might spur us to provide new and different materials on the math shelf. When a mother tells us that her child struggles with clean-up at home, we know to really focus our appreciation on the hard work he is doing on clean up at school. Families and teachers meet together to set individual goals for children three times a year, and talk informally on an ongoing basis about children’s evolving interests and progress. that children have the capacity and the right to express their feelings and thinking through many different “languages” or media. 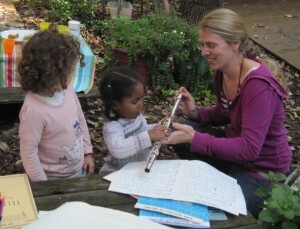 that good curriculum consists of authentic work that grows from the interests and passions of the children. that documentation of children’s work through written transcripts, photographs, and teacher commentary forms the best basis for understanding each child’s development, and for planning curriculum accordingly. that a beautiful, thoughtfully equipped classroom environment is a “third teacher” that complements parents and classroom teachers. that parents and teachers are partners in the child’s education. that conflict is healthy and necessary to learning and collaboration. that children are the protagonists in their own life stories. that joy and friendship should be the principal ingredients of life at school. 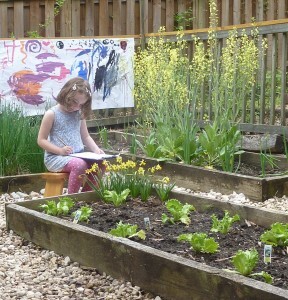 In Reggio Emilia, ours is a different idea and attitude toward the young child, who we see as active and who, along with us, searches every day to understand something…to grasp a piece of life. This way the teacher becomes a researcher of learning, as the children are researchers of the meaning of life. This is a paradigm shift of viewing the child as cute and weak to an image of the child as competent.